Whenever we break a coffee cup, it generally ends up in the garbage, unless it is just the handle that breaks off. That gets super-glued back on. Broken things are unusable, right? In Japan, there is a process of fixing broken pottery that has been raised into an art form. It is called kintsugi. They fix it by filling the broken places with a gold lacquer, in a sense embracing the brokenness. Earnest Hemingway in A Farewell to Arms wrote, “The world breaks everyone and afterwards many are strong in the broken places.” Except even strong, broken people have a hard time holding the pieces together. Eventually Hemingway committed suicide. No matter the level of inner strength, it’s finite. He did accomplish writing timeless books even with his limited vocabulary. I had to face my own brokenness the first two weeks of July, starting with the holiday weekend. Neighborhood kids blew up some fireworks next door and it startled me. I made a mental note to find a way to drown out the noise in case they trigger a flashback. A picture on TimeHop had already triggered one earlier; I did not want another one. Later there was a big bang, except I wasn’t in our little house; I was taken back to the bathroom two years earlier listening to screams. I teared up as I dug out my earbuds, cranked up my music, and later putting on muffs because I could still hear the fireworks in the background. I made an appointment with my doctor to verify what I suspected, post-traumatic stress disorder. I looked into it about a year and a half ago and thought I had avoided it. ‘It didn’t break me, just almost broke me’, I had told myself. The doctor said short of a psychologist or psychiatrist doing a DSM-IV to empirically confirm it, it looks like I do have PTSD. I’ve been in psychotherapy, counseling, grief counseling, and learned how the Stoics sucked it up and moved on, yet I still have the cracks and hold myself together. 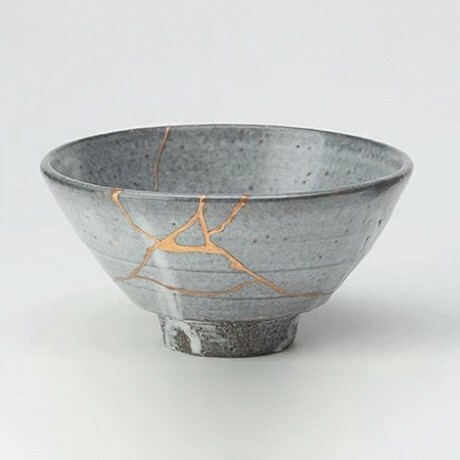 Except in kintsugi, the pottery is not fixing itself. There is an artisan who is taking the broken and making it beautiful. Nick Vujicic was born without any limbs yet he is an evangelist and motivational speaker. The former lead singer of Flyleaf, Lacey Sturm, planned to commit suicide one day when her grandmother took her to church—not knowing her intent—where she met a guy. One of my friends is in Celebrate Recovery; he is being led to be a public speaker and apologist, because he met a guy. This guy is an artisan; his work is seen in many broken people. “For what we preach is not ourselves, but Jesus Christ as Lord, and ourselves as your servants for Jesus’ sake. For God, who said, “Let light shine out of darkness,”[ made his light shine in our hearts to give us the light of the knowledge of God’s glory displayed in the face of Christ. It is written: “I believed; therefore I have spoken.” Since we have that same spirit of faith, we also believe, and therefore speak, because we know that the one who raised the Lord Jesus from the dead will also raise us with Jesus and present us with you to himself. All this is for your benefit, so that the grace that is reaching more and more people may cause thanksgiving to overflow to the glory of God. Yeah, we’re all broken in one way or another, our weakness is apparent, and through that weakness God can work. We can identify with other people in the same spot, give advice that comes from experience, and more importantly listen to them with understanding. We can build a bridge and walk with them to introduce them to the reason for the hope that we have, Jesus Christ.